Inside The Gallery this morning…. A new art exhibition…… “Mannequin” the video below shows what I’ve been painting recently. The Gallery is my 1:12th scale Art gallery which today has on display my latest collection of dolls house paintings. 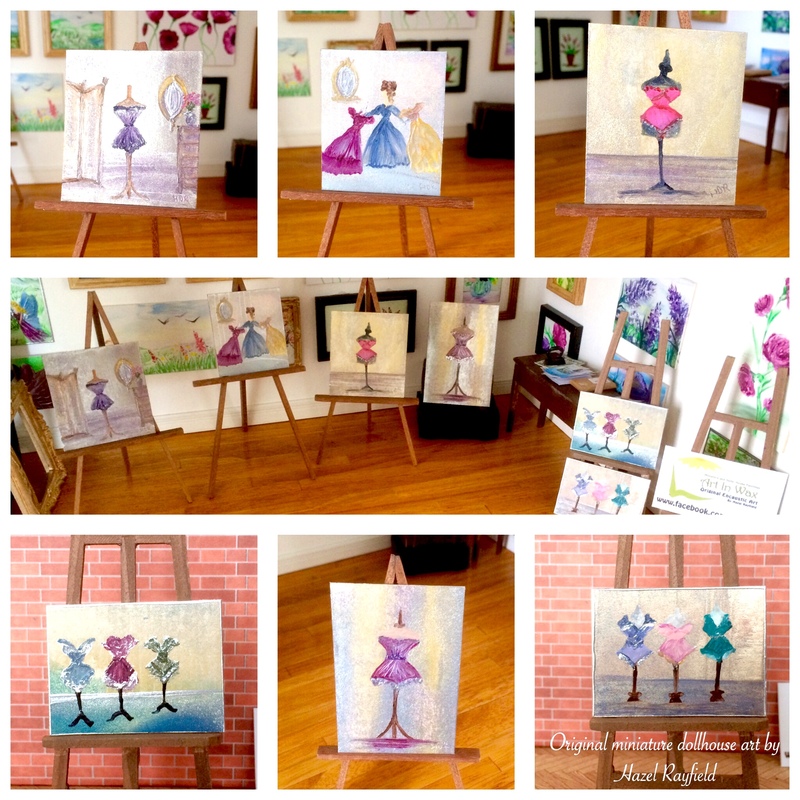 These miniature paintings are based on the theme of mannequin dressed with Vintage style lingerie….. there is also a dress painting which ties to the theme as a Dressing Room perhaps a ladies maid getting the dresses ready or it could be a dress shop. 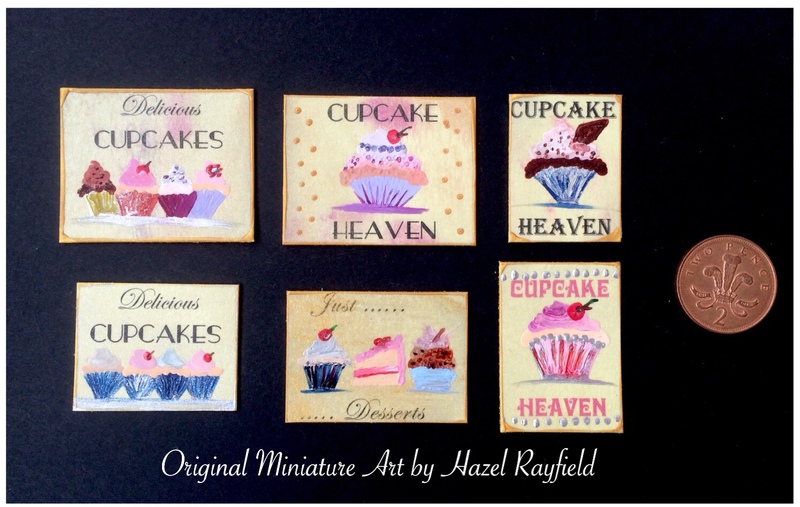 Encaustic Wax paintings in Miniature. 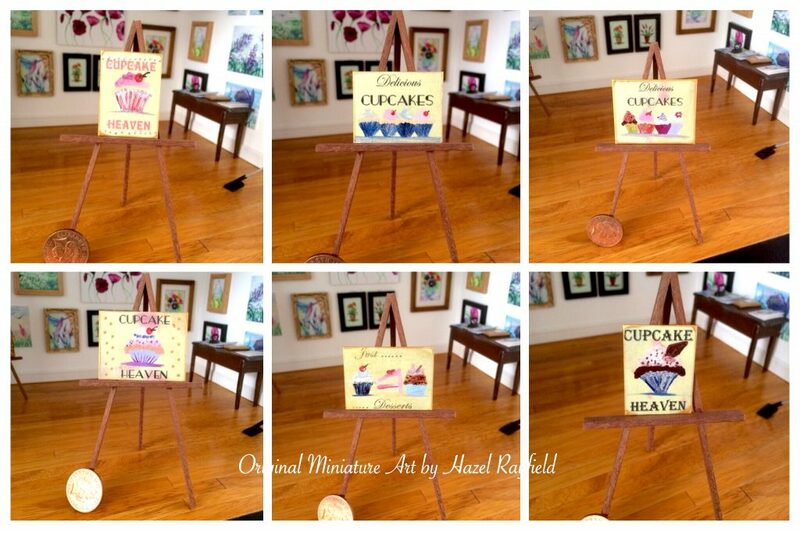 I paint using branded wax medium which I melt and paint with using a collection of heat tools. These range from specialist encaustic irons and stylus heat tools, with various nibs and tips some of which my husband has adapted the tips of so I can paint tiny. I also use a hot plate and craft heat gun, all of which go into the creating my paintings in varying ways. Plus postage and packaging.. I ship worldwide. As many of you who read my blog know I have a passion for painting in hot wax – using many techniques, different wax formula and on various supports. I also paint in many styles and sizes, including miniature. I really enjoy the challenge and the results when painting encaustic in miniature. Again if you have read my blog in the past you will know that I also own a miniature property a 1:12 scale Art Gallery which my very clever and patient husband Adrian built for me. The Gallery as it is called resides in our home and houses a collection of my tiny Art, it is a fun addition to our home. 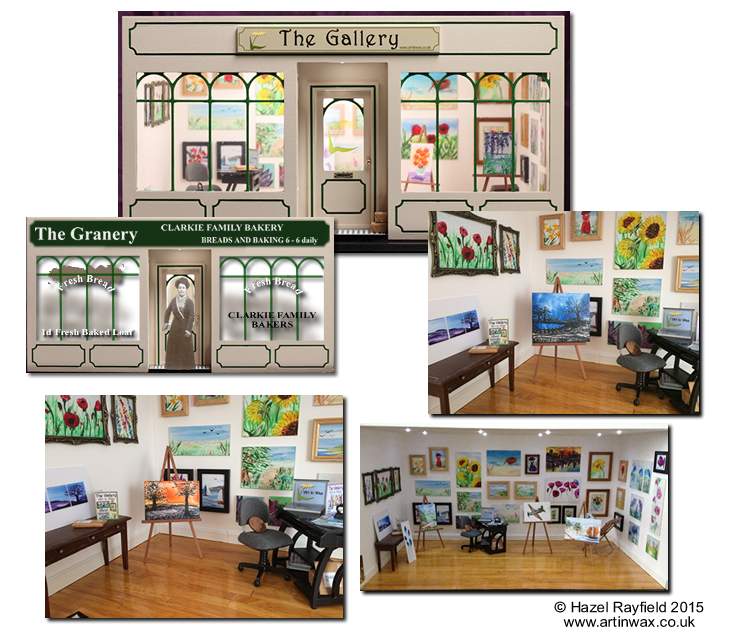 The Gallery had its grand opening in 2013 and since then Adrian has also built some easels and an Art Browser for display and the paintings change from time to time too. When we were planning and building The Gallery we chatted and a “back story” developed over time so just for fun I thought I might share our (frictional) story ……. The property at 27 Coast Road is a Victorian double fronted shop property which started life as a bakery called The Granary. It has seen many changes over the years, starting as a bakery where the bakers worked long hours and mostly baked bread that they delivered, sold at market or was collected from the shop. Then moving into an era where cakes and sweet treats became popular and Ladies would browse and shop for delicious sweets and later having part of the shop became a small tea room, where tea in China cups graced the tables and cakes and pastries were enjoyed. But in time with post war rationing and the rise of convenience foods and supermarkets the family business closed and the shop stood empty for some years, still owned by the family but no longer a going concern. In the 1990’s a Mr Rayfield moved to this part of town, he was a builder by trade and as he past the shop in disrepair, each day on his way to work and thought what a shame it was that should a wonderful building was no longer being used. Some years later, Mr R married and settled down, his wife was a very keen artist and with his encouragement starting showing her art in exhibitions and selling her paintings on the Internet. All in miniature of course 😉 wink !!!! !